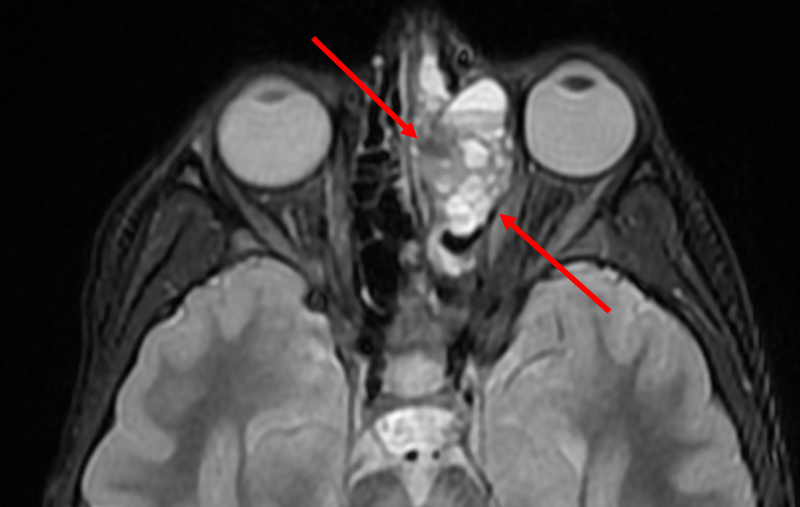 Sinonasal Osteosarcoma – Axial STIR (short tau inversion recovery) sequence through the face demonstrates a lobulated hyperintense mas in the left ethmoid sinus with multiple blood-fluid levels. 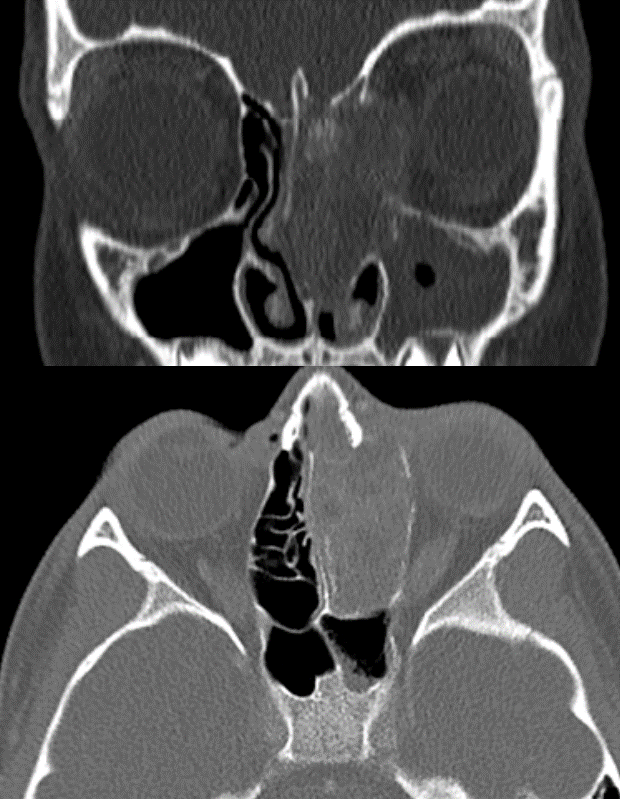 Sinonasal osteosarcoma – Coronal and axial CT scan of the face demonstrates a large expansile mass with calcifications in the left ethmoid sinus with erosion into the left cribiform plate and left lamina papyracea. Osteosarcoma uncommonly arises in craniofacial bones, but when it does it occurs most often in bones of the jaw and has only very rarely been reported to arise in the nasal cavity or paranasal sinuses as a primary tumor. Most sinonasal osteosarcomas are high grade. Sinonasal osteosarcoma usually presents with pain, epistaxis, paraesthesia, swelling, lacrimation and displacement of the adjacent eye. Typically osteosarcoma in the sinuses and nasal cavity appears as an infiltrative, calcified tumor with associated soft tissue mass. Previously reported cases of low-grade sinonasal osteosarcoma have shown variable features, including a soft tissue mass with well-defined cystic areas and no abnormal ossification or calcification.